I thought I would experiment a little with frozen bread dough for this recipe. The first rendition was simple, though tasty, and included mozzarella, butter and parmesan on the inside. While you can fill the dough with those ingredients and come up with an excellent bread, I wanted to try something a little different. If you haven’t yet, check our our free leavening agent cheat sheet. It gives an at-a-glance reference for the differences between instant yeast and active dry yeast, as well as baking soda and baking powder. :)I thought I would experiment a little with frozen bread dough for this recipe. The first rendition was simple, though tasty, and included mozzarella, butter and parmesan on the inside. While you can fill the dough with those ingredients and come up with an excellent bread, I wanted to try something a little different. 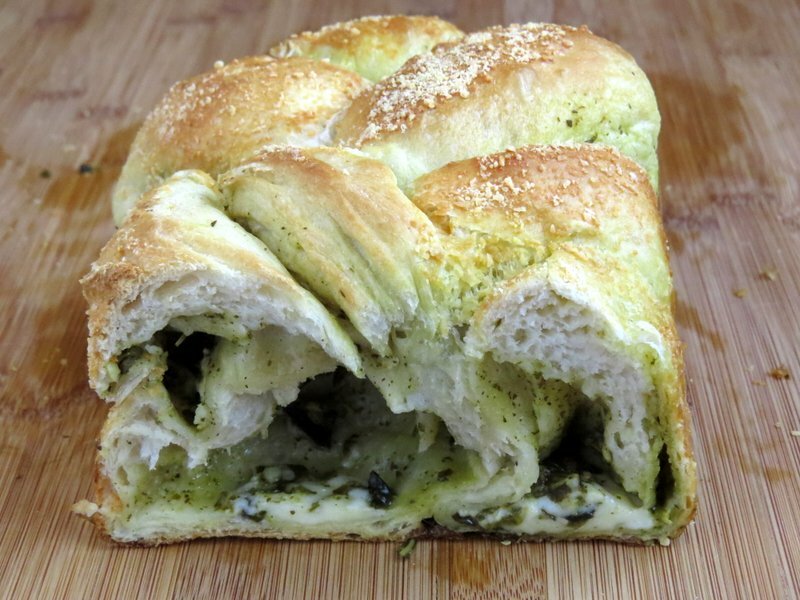 Frozen bread dough is used to create three pesto and mozzarella filled ropes to be braided into one delicious pull apart loaf. Place frozen loaf in bread pan which has been sprayed with non-stick spray. Place a sprayed sheet of plastic wrap on top and let rise for 4-7 hours. Refer to package. Place dough on a floured surface and divide into 3 equal pieces. Roll or stretch dough into a 12 inch by 4 inch rectangle. Brush water along a 1" section on the long side of the dough. 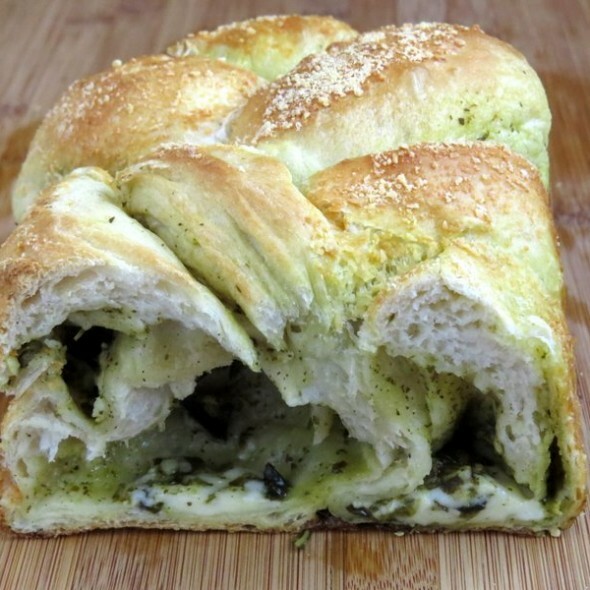 Spread the remaining dough with 2 Tablespoons of pesto. Place the string cheese halves alongside each other, then roll the dough like you would a cinnamon roll and pinch seam and sides. Place the three rolls side by side and pinch the three together on one end. Braid the three rolls and then pinch the ends together. Brush with egg white and sprinkle with parmesan. Place in a preheated 350° oven for 25-30 minutes or until golden brown. 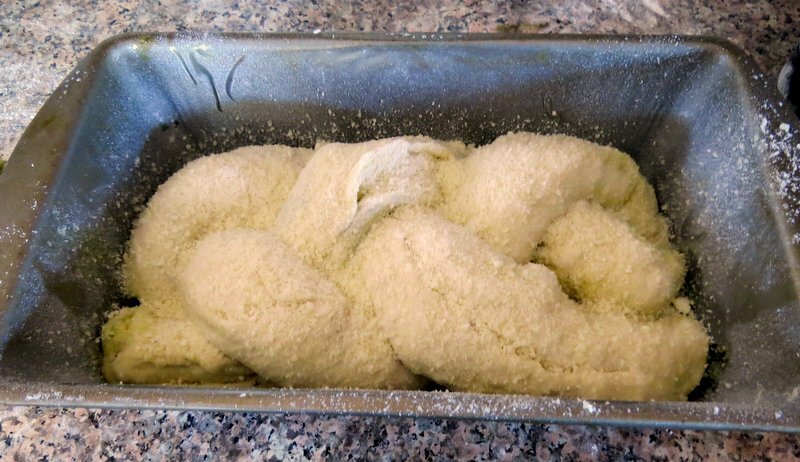 Posted in Game Day Party RecipesTagged frozen bread dough, pestoBookmark the permalink. This is the time of year when I am CONSTANTLY searching for another way to use up all the basil in my garden…this looks like a perfect solution! Pesto bread, here I come!